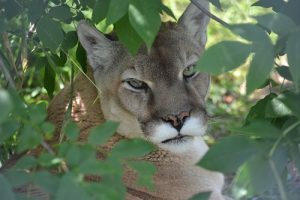 With tears, we said good-bye to one of our sweetest residents, Max the cougar. After being treated for constipation, he had a few good days before he declined quickly due to a mass on his liver. Our hearts are broken, but also filled with love for this gentle giant. His story is a little long, but every aspect of Max’s story is so important to share. Have you ever known an animal is meant to be with you, but you don’t know when and how it will happen? Life has a funny way of bringing things full circle and those are the moments you really want to pay attention to. Because something truly special will come into your life, just like Max the cougar. I know we say every cat is special and they truly are. And we rescue so many gentle giants that have no reason to forgive us, but do. Max was privately-owned in Iowa before needing a home due to a divorce. When I received the call and heard his story, he really touched me, and I wanted TWS to be his forever home. But I also had to make the best decision for him, and we had just taken in the ‘5 wild’ cougars who were still in 3 separate groups. A small, temporary pen would need to be constructed for Max, and that wouldn’t have been fair to him. We reached out to other sanctuaries, but it was at a time the industry was bursting at the seams and no one had space. An accredited local city zoo in Duluth had been looking to help a rescued cougar. They had a habitat, trained staff, wonderful vet care and little foot traffic. They also wanted to help educate the public that wild animals should not be kept as pets. Max’s story would do just that. Several years passed, but we continued to follow his story. Max became the most popular resident at the zoo. He educated many about the plight of wild animals kept as pets and enjoyed his ambassador role. He chirped to guests, purred at caregivers and was receiving first class care for his broken teeth and arthritis. Then a flood hit the zoo and damaged enclosures. We learned from the USDA that they were looking for a home for Max. Of course, we jumped at the offer to take in this special boy, once and for all. Max arrived at TWS a few years ago at the age of 16. His sweet disposition made his transition easy and he fit right in next to the other cats. Every day he was relaxed in his hammock, chirped hello and the roar of his purr was constant. He didn’t mind living next to big tigers like Zeus or rambunctious ones like Daisy. Max kept his own pace, a calm, confident one. We knew with his degenerative arthritis that Max wouldn’t be with us forever, so we cherished every day – and so did he. He enjoyed enrichment, crated on his own for habitat moves and was kind to each neighbor he met. We were cautiously optimistic when on his first day ever of leaving food, the vet staff saw him immediately and treated him for constipation. We were hoping it was just that, but we know that can often be a symptom of something larger. The next few days he was outside and acting like his old self. Our hearts were hoping. But then he curled up in his hammock and became lethargic again. We knew it was something more. And as difficult as that realization was, again we had to make the best decision for Max. His liver was failing, and it was time to say good-bye. Saying good-bye to any resident is so very hard. But saying good-bye to one that thanked us each day for our work with chirps and purrs leaves a little bigger hole. We all need that reassurance that we are making a difference in their lives, especially when there are so many we cannot save. Thank you, Max, for playing a bigger role in your life to share your story. We will make sure it lives on – always. As a sanctuary, we’re a home for life to all our rescued residents. But at TWS, we take that even one step further. We follow and commit to providing a forever home for all the cats we refer to other reputable facilities and sanctuaries, too. If, for any reason, a sanctuary or facility cannot care for the cats we’ve referred or placed, we’ll do everything we can to provide them a home for life. And that’s the story with Max. Celebrating a new home, a new birthday, and a new life! Max turns 16-years old this month as he arrives at The Wildcat Sanctuary! He’s a kind-hearted cougar who suffers with arthritis. He’s been receiving the best medical care to keep him pain-free. Because of your support, he’ll now be able to live his golden years at The Wildcat Sanctuary. In 2011, we received a call from a private owner needing to surrender a cougar due to a divorce. At that time, TWS had just taken in cougar kittens Carlo, Noah and Langley, and we didn’t have habitat space for him. 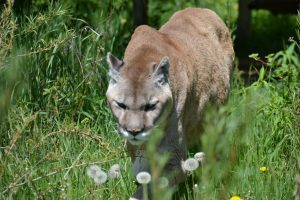 The Lake Superior Zoo had lost their other cougars due to old age and they agreed to accommodate Max. We support zoos that help rescue privately-owned cats, especially when there aren’t enough sanctuaries to take in every cat in need. We’re thankful they used Max’s story to educate people about why wild animals should not be kept as pets. Watch the video they produced HERE! Max has spent the last six years at the Lake Superior Zoo. Due to flooding and a new facility plan, the zoo decided to renovate habitats, including where Max was living. When we heard of this, we reached out to the zoo offering a final and forever home for him. Max moved very easily. From the moment he arrived at the Sanctuary, he acted as though he’d lived here his entire life. We’ve never had a cat adapt so quickly to their new life. He explored both his indoor and outdoor areas and met his new neighbors, without missing a beat. Max reminds us a lot of our cougar Spring who we recently said good-bye to. If Spring melted your heart, Max sure will, too. He also has a gentle and social demeanor, was 4-paw declawed and has arthritis. We’ll make sure to provide Max with everything he needs to enjoy life to the fullest during his golden years. If you’d like to help by sponsoring Max, you can do that HERE. 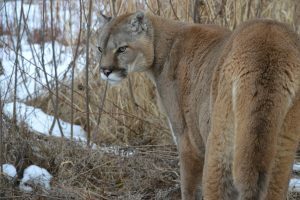 Sandstone, MN (NNCNOW.com) — The Lake Superior Zoo said goodbye to Max the Cougar today. The 16–year old has a new home at the Wildcat Sanctuary in Sandstone after spending five years in Duluth. Click here to subscribe to our daily newsletter.